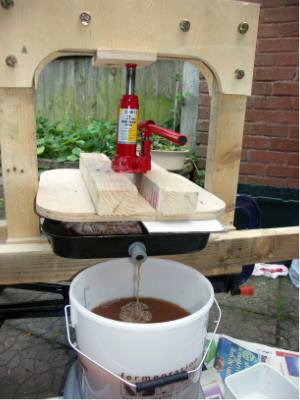 This page contains free plans and step by step instructions on how to make your own apple press. I took the photographs at various stages when I made mine. 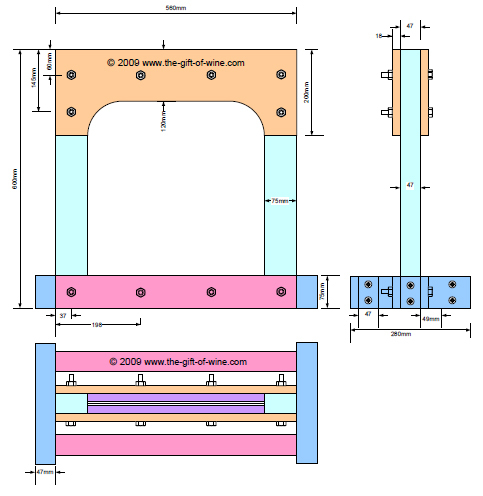 Download the Fruit Press Plans. Study the plans and the following assembly instructions carefully before you begin. 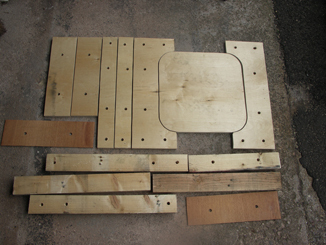 This photo shows all the timber used.The parts at the top of the picture are cut from a single piece of 560 x 1040mm x 18mm plywood. These are shown in the next photo. Study the plans to see where they all fit in. The two darker pieces are cut from 6mm thick plywood. 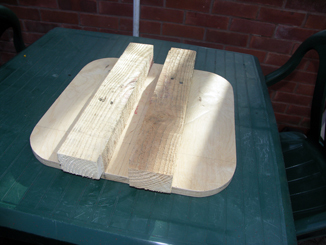 The remaining pieces are cut from 75mm x 47mm (3inch x 2inch) rough sawn timber. 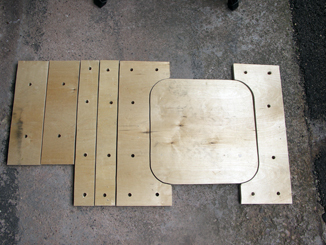 Pieces cut from a 560 x 1040 x 18mm plywood sheet (repeat of part of picture above). 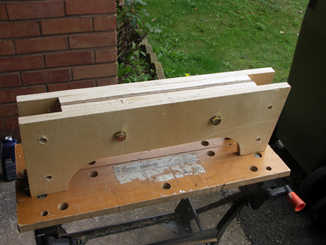 The holes were not drilled at this stage but were drilled during the assembly process. I used a Jigsaw to cut my wood. Assemble The Top Bar. Bring all 6 pieces together and hold in vice. Drill the 6 holes for the bolts. Apply PVA Wood Glue to all inner surfaces. 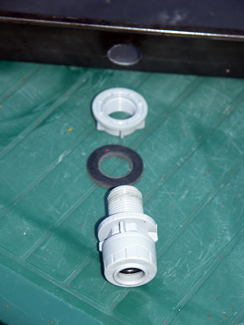 Insert 2 centre bolts but dont fully tighten yet. 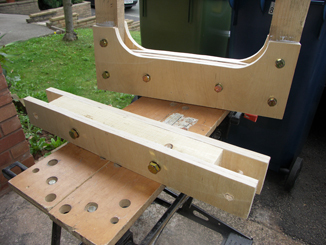 Place side bar in position and drill 2 holes. 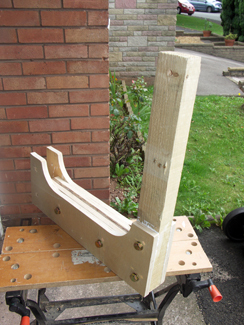 Apply PVA Wood Glue to top and insert 2 bolts. Repeat with opposite side bar. Assemble The Top Bar. Bring the 3 pieces together and hold in vice. Drill the 4 holes for the bolts. 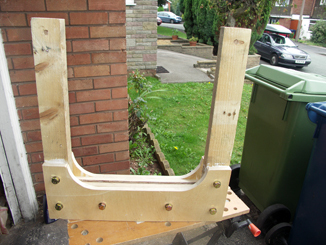 Apply PVA Wood Glue to inner surfaces and insert 2 centre bolts but dont fully tighten yet. 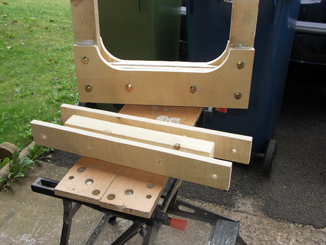 Put bottom bar into place and drill 2 holes. 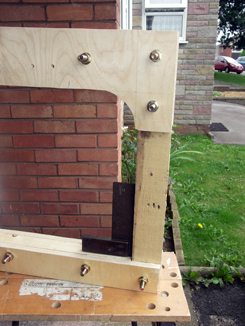 Apply PVA Wood Glue to lower ends of side bars, insert bolts. Use a Set Square to align at right angles then tighten all bolts with a Socket Set or Spanners. Fit 2 cross bars to press plate. 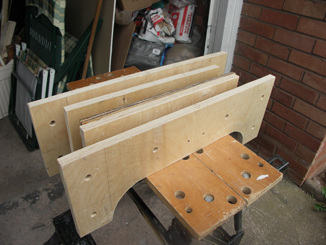 Drill holes from underside, apply glue and screw in place. 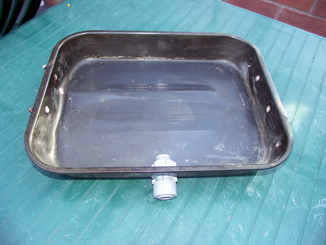 The juice collection tray is an old baking tray. I drilled a hole on one edge, filed it to the right size and fitted a plastic drain plug that I got from a DIY store. Detail of drain hole and plastic drain. Note 1: I had to fit a piece of scrap plywood to the under side of the top bar as the Bottle Jack began to damage it. I will fit a metal plate for this years pressing. Note 2: I fitted an Acrylic Sheet under the pressing plate to stop the juice soaking into the wood. I hope the above information has been useful to you and wish you well with your construction. However if you find that constructing a press is beyond your capabilities or you do not have the time to do it then there are a couple of ready made presses that I can recommend.